#FASHIONstylingON’em >>>> PUMA with his Big Sis SASSY and their Lil RED Headed Friend. Don’t Miss the “NEW” Season on MARCH 31st at 9:30PM/ ET/PT. Nick Cannon AKA..Mr. Business Man slash Married man…looks like he’s getting a LiL yoked up!!! Drake after one of his recently performances….. 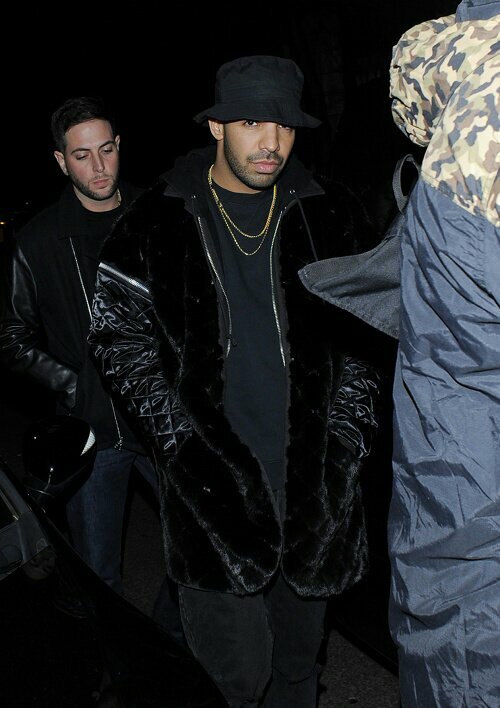 In his flyy black fur jacket. ..
Trey Songs & Model Vixen Rosa Acosta inside of Bugatta Restaurant in Los Angeles, CALIFORNIA. Trey Songs Hosted a Video Premiere Party for his New Single ” Na Na” and Rosa Acosta is in his new video. Ashanti will be singing the National Anthem for Manny Pacquiao to set off the Show with the HBO Pay Per View REMATCH with Tim Bradley on April 12th, 2014 in Las Vegas at the MGM Grand.